Why? Well, sometimes it feels like I am living in two lives - there’s my riding in the van and sleeping in hotels life - and then theres my at home with my girlfriend and dog life. When I am home I like to strictly listen to vinyl and when I am on the road the guys and I are listening to a pretty wide verity of modern artists, new music and old classics. Why Vinyl you ask? For me it’s the irreplaceable warm texture and the light crackle of an album you love. In my case many of my favorite prints have been around longer than I have. There’s just something about the collecting of a physical copy of something that you can admire, read and hold in your own two hands. Each album is a unique reflection of the artist in a snapshot of that time and chapter in their life. In stark contrast, downloading an artist’s hit song from iTunes gives the instant satisfaction of hearing that song that’s been stuck in your head for days, but leaves the rest to linger in space out on the interwebs… or whatever happens to all those poor, less popular songs. With an LP you’re forced to listen to the best and worst of an artist and I think thats the way it should be. Be present, right there listening to every last lyric and note until the needle lifts and you have to get up and flip it to the other side. The danger with this hobby/obsession is that I have been enjoying the hunt and finding of the albums I seek for the past seven years. Over that time I have acquired a pretty expansive collection, if I do say so myself. This is where you run in to the best problem you could ever possibly have - too much music to listen to. It can be overwhelming at first, so now when I’m at home I have made the rule to only listen to Vinyl. I will usually listen to the same album three to five time before I move to the next one, I don’t know if its the same for everyone, but I usually have to listen to something new at least that many times to determine if I really like it or not. In the band van we usually have about five or six different albums with us depending on how long we are going to be out on the road. Sometimes one of us will bring a few hard copies from home or download something new that we haven’t heard yet - seems like someone we like is always coming out with a new album. There are albums that make their way back around sooner than others and that, along with new music discoveries, is what this blog series will be about. Before putting out my first studio album last May, I found myself listening to the ‘first albums’ of a lot my favorite artists. I'm not exactly sure what I was looking to find, it was just the personal test to see how mine held up I guess. Comparing yourself to the best can be frustrating, but I also think it is important to know where you stand on the bridge between good and great. This album put me in my place. To me Townes is one of the most iconic songwriters of all time. He is one of the few that can pull off writing a song that everyone and their cat understands and then turn around and write a piece of poetry that makes you feel like only you can really understand it. Some of the lyrics are so far out there that one must use their imagination to comprehend the message. Townes died in in 1997, I was 5 years old - which means I never got to see him play live. If I could go back in time for one show, his would be it! 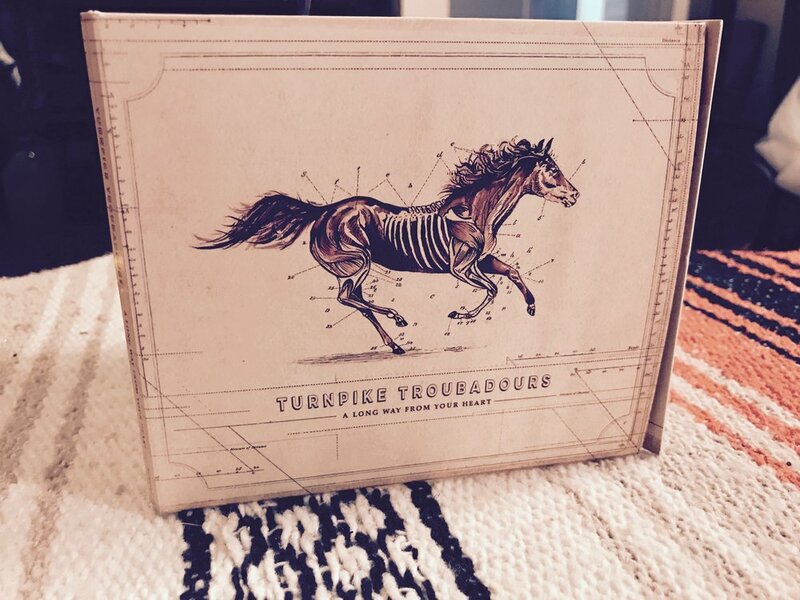 The Turnpike Troubadours are a band that I’ve been following for the past seven years and the longer I listen to them the more I respect and appreciate their music. Their lyrical genius, incredible musicianship and well thought out arrangements never cease to impress me. The new album A Long Way From Your Heart dropped in late October and it's basically all that we’ve been playing in the van since. I was almost nervous for this album because their last 3 have been so great that I wasn’t sure how they would improve, but somehow they managed to do it again. A Long Way From Your Heart is an incredibly strong collection and will be one that I will look up to as I work on putting out more of my own albums in the future. One of my favorite things about the Turnpike Troubadours is that their live show is always as good if not better than their recordings. If you ever have a chance to see them live, GO DO IT! Well there you go, that's what I'm listening to this month. Stay tuned for more what's spinning in the upcoming months!